I hold degrees in Information Science, Library Science, and Math and Computer Science. Previously, I was a professor at Syracuse University's School of Information Science from 2001-2015, where I was the director of the Masters of the Library and Information Science program. I was also a visiting professor at MIT's Gambit Game Lab during the 2011-2012 academic year. I have written one book, Everyone Plays at the Library and over 50 research articles which can all be found in full text at my personal website. My main interest is in creating games and helping others create games and simulations that can change the world, otherwise known as transformative games, serious games, educational games or applied games. Based upon the situation, these might be board and card games, digital games, or live-action games like Escape Rooms. I explore methods of participatory design, where I encourage the community to be a co-creator in the games through game jams and workshops. I also work on Meaningful Gamification, which is the use of elements from games other than rewards to motivate people. My current research is focused on how we can use design concepts from Escape Rooms to make engaging activities for places of informal learning like museums and libraries and for training activities for corporate and non-profit organizations. Winner of Best Non-Digital Game at the juried Game Expo at the Meaningful Play 2016 conference for the Breakout EDU game, Ballot Box Bumble. Sole designer of two published board games: Going, Going, GONE! (2013) and Tulipmania 1637 (1999). 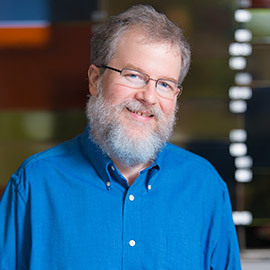 Host and producer of Board Games with Scott (2005), the first Web-based video series about board games. Professor of the Year, 2003, Syracuse University School of Information Studies. Pratt-Severn Faculty Innovation Award, 2011, a U.S. National Award for Information Science educators, granted for my 2009 Games in Libraries online course that was taught via YouTube. The goal of the Brantford Games Network is to connect Laurier students interested in game design with places in the community where there is a need for a game. There will be ongoing projects and game jams with different community partners. In addition, every few weeks, there will be a Freeplay Friday where students in the Game Design program will have their games available for people to playtest. During these sessions, anyone can bring their own game designs for testing by other designers. The summer Prototype Development Program creates opportunities for Game Design and Development program to create games for real world clients. During the summer of 2017, we are working with 12 students from 7 different schools to create climate change games with funding from the Government of Ontario. Nicholson, S. (2016). Ask Why: Creating a Better Player Experience Through Environmental Storytelling and Consistency in Escape Room Design. Paper presented at Meaningful Play 2016, Lansing, Michigan. Nicholson, S. (2015). “Peeking behind the locked door: A survey of escape room facilities.” White Paper. Nicholson, S. (2015). “A RECIPE for Meaningful Gamification.” In Wood, L. & Reiners, T., eds. Gamification in Education and Business, New York: Springer. 1-20. Preprint available online. Nicholson, S. (2013). “Playing in the Past: A History of Games, Toys and Puzzles in North American Libraries.” Library Quarterly 83(4), 341-361. Nicholson, S. (2013, June). “Exploring Gamification Techniques for Classroom Management.” Paper Presented at Games+Learning+Society 9.0, Madison, WI. Nicholson, S. (2012, June). “A User-Centered Theoretical Framework for Meaningful Gamification.” Paper Presented at Games+Learning+Society 8.0, Madison, WI. Full text of most of Dr. Nicholson’s publications can be found at scottnicholson.com/pubs.